At American Japanning, we combine over 30 years of coating experience with dedicated customer service to provide a variety of industries with custom coating services. We provide thermoset and air cure coatings including acrylic, epoxy, and urethane coatings as well as Kynar 500/ Hylar 5000 PVDF coatings. PVDF resin-based coatings provide brilliant color and superior UV, moisture, and corrosion resistance. American Japanning is certified by all major manufacturers to apply PVDF coatings and has been providing PVDF coating services for over 50 years. All coatings are applied with modern spray equipment or through the dip and spin process. Parts can also be masked for decorative or functional purposes. When selecting a coater, many customers overlook the importance of pre-treatment. Proper cleaning and preparation of the substrate is essential to adhesion and performance of the top coat. Our pre-treatment services include cleaning such as solvent degreasing, spray washing, and alkaline immersion. Pre-treat options including chromate conversion coating (chem-film) and phosphate coating ensure that the substrate is properly prepared to accept the specified coating. Pre-treatment, coating, and testing are all performed according to the specified industry standards. 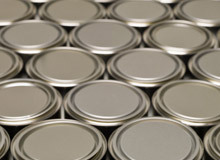 Special handling requirements including part marking and labeling can be accommodated as needed. Our experience spans customers in the military, appliance, automotive, and architectural industries. Lead times are very short, with most jobs completed in 5-7 days. Expedited rush services are available as needed. For more information about our industrial coating and painting capability, see the table below, or contact us directly. Copyright © 2014 American Japanning, Inc., All Rights Reserved.